So...the Civil War, last time I checked, was not in the 1850's but the early 1860's. 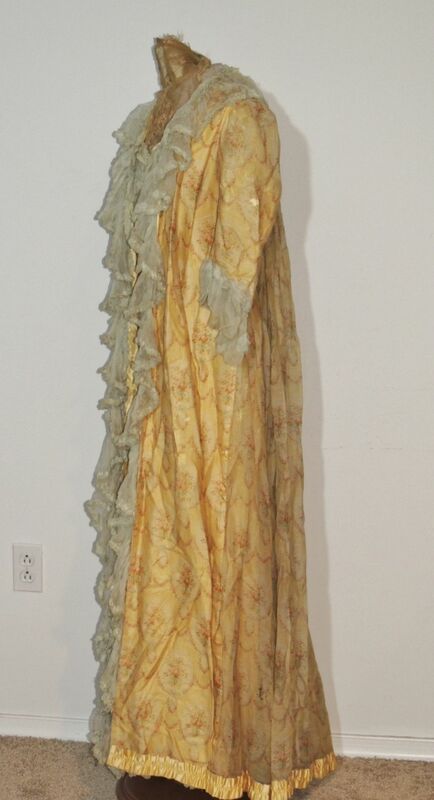 One or the other seller, one or the other. 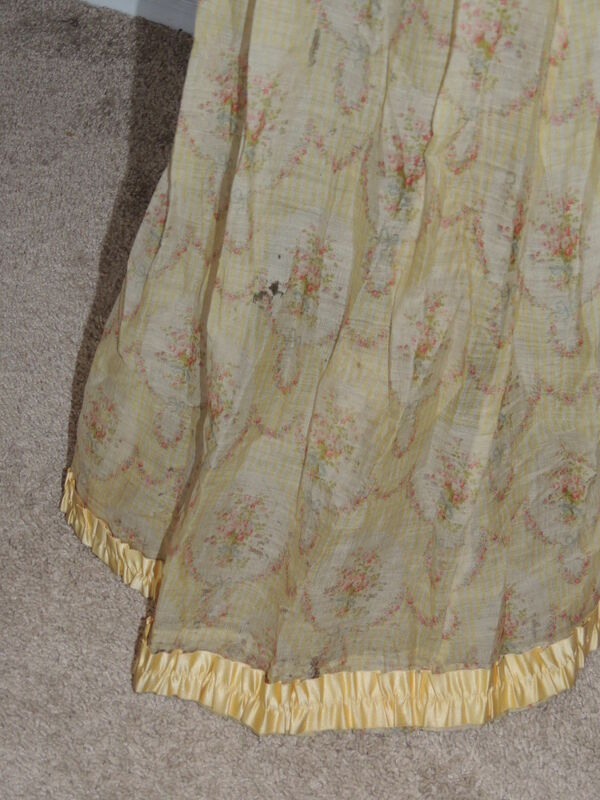 This is very much a maternity dress - notice the pleats on the front of the skirt? 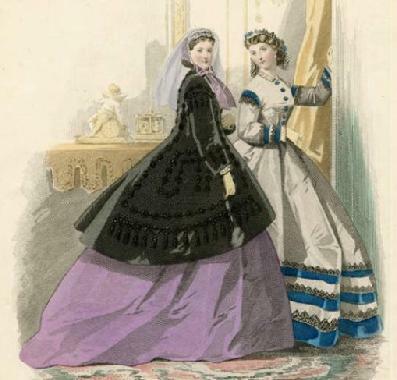 That indicates the first half of the 1860's - ie, pre Bustle. 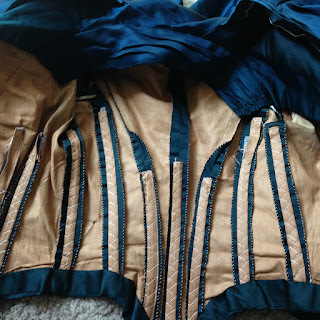 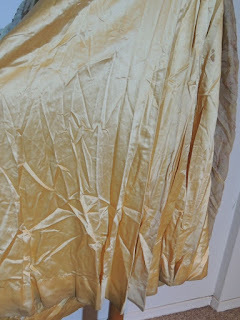 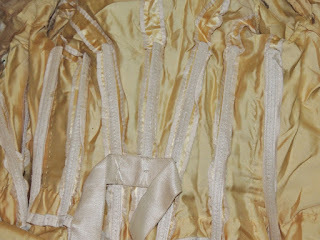 Then there is the waistline - notice how is goes up in the front compared to the back? 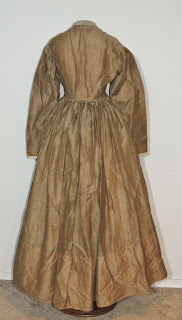 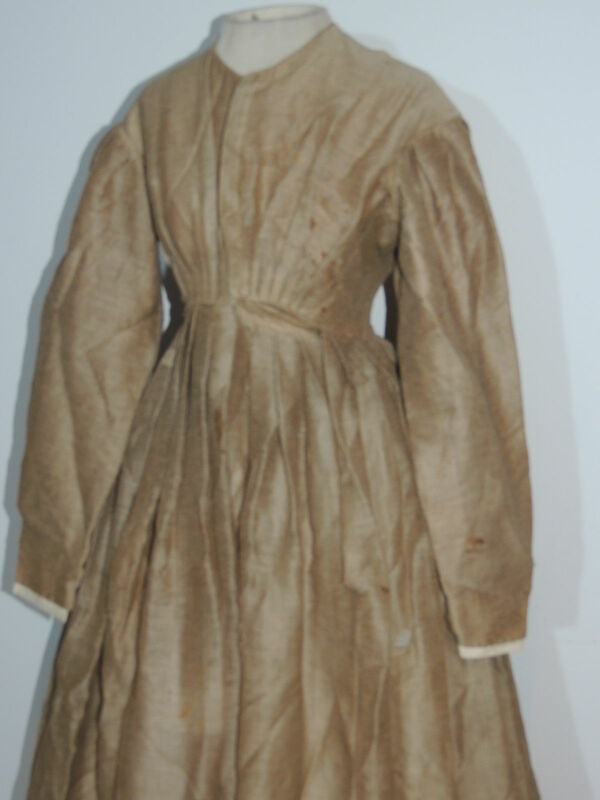 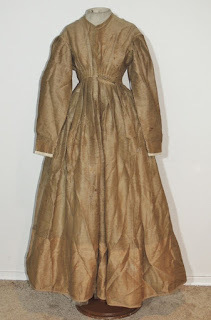 This isn't just an "empire" waist dress we are used to seeing in the second half of the 1860's. It's also a rather plain house dress, an everyday type dress. 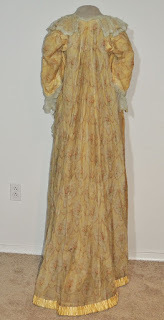 I hope everyone enjoys this last dress before I head to Pennsic. I'll be back and posting on August 13th, hopefully! 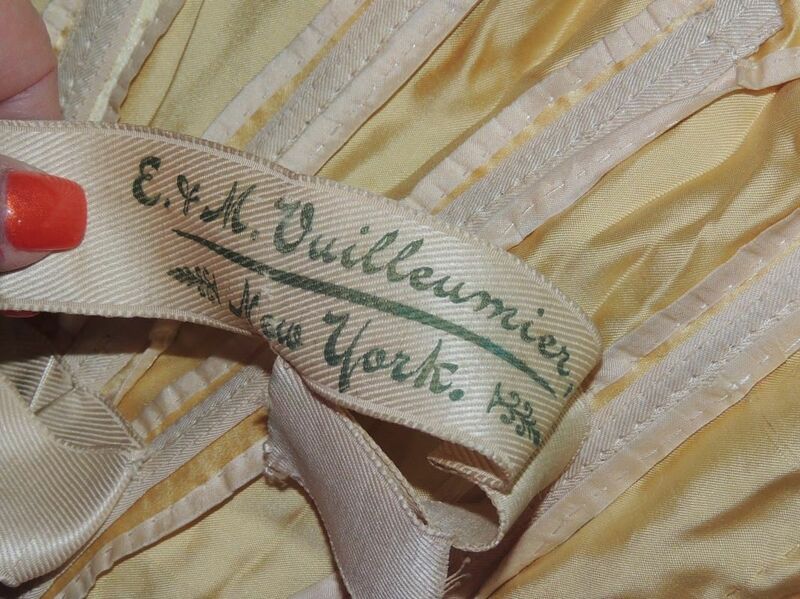 It actually says Vuilleumier - a pretty common last name when you search it. 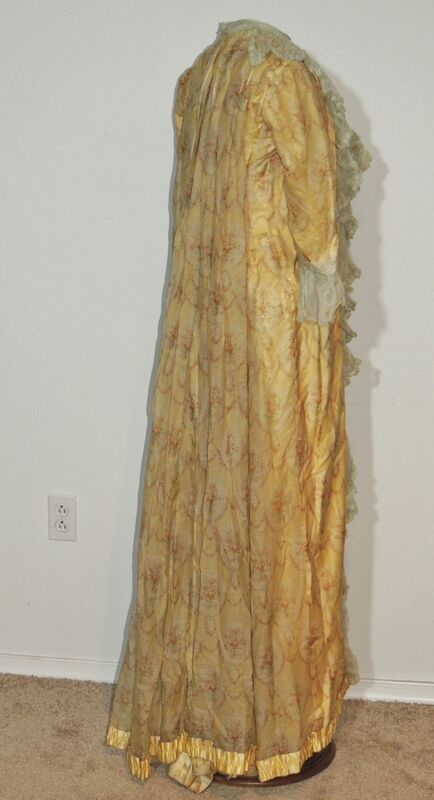 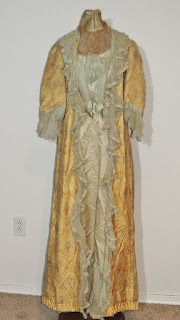 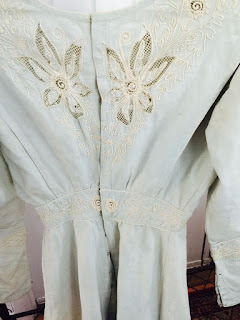 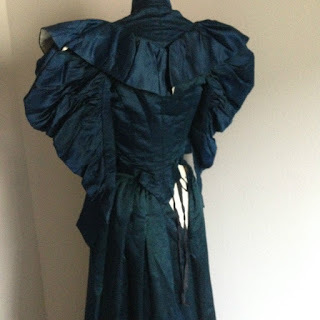 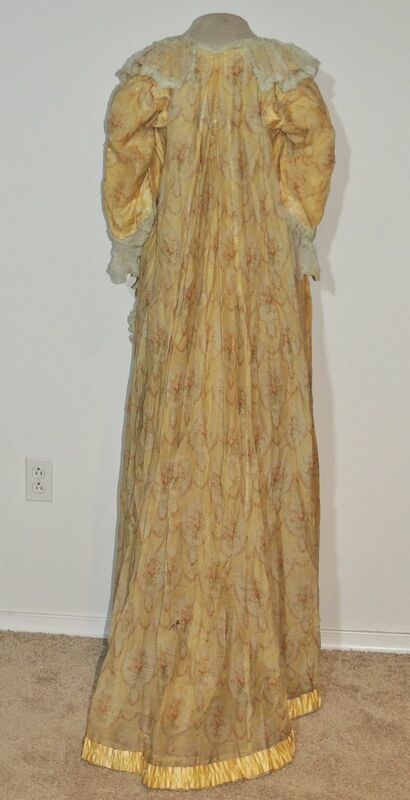 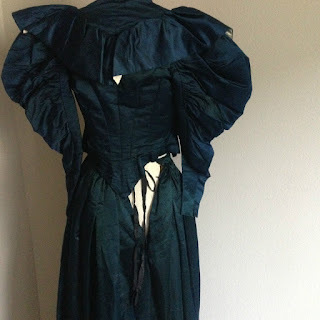 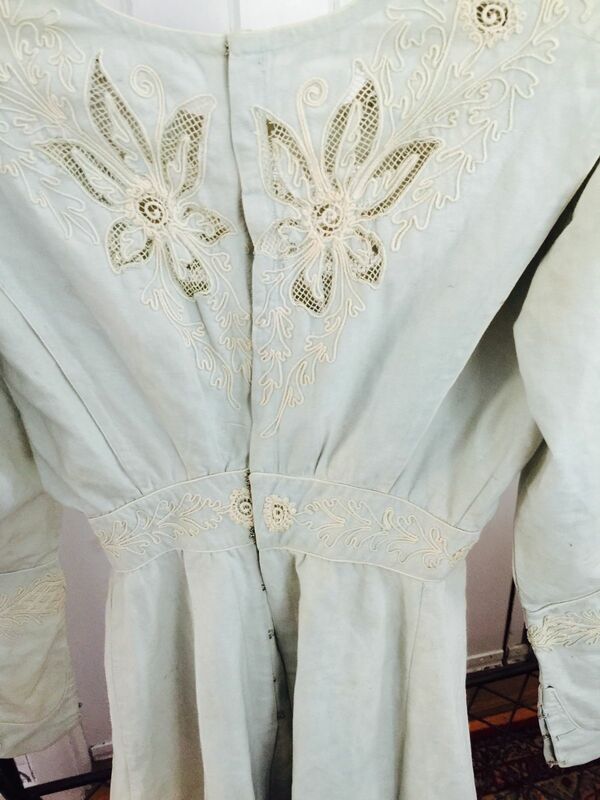 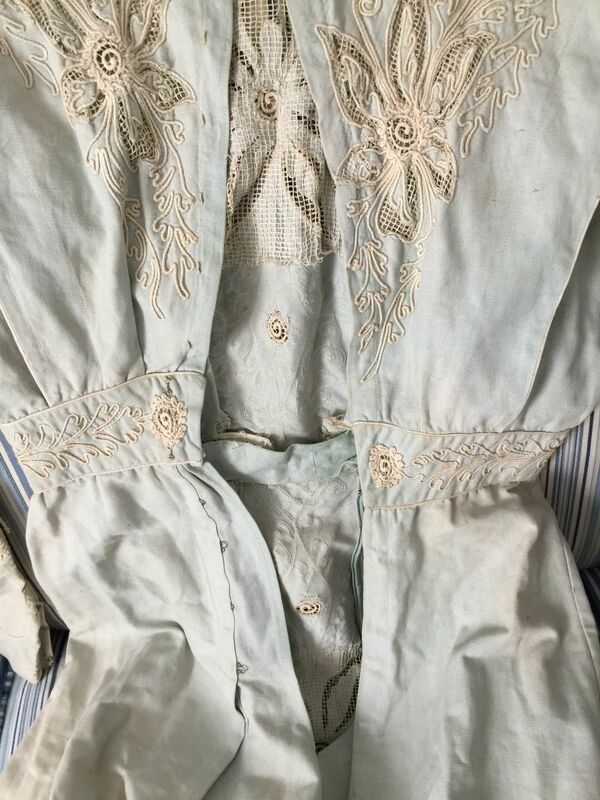 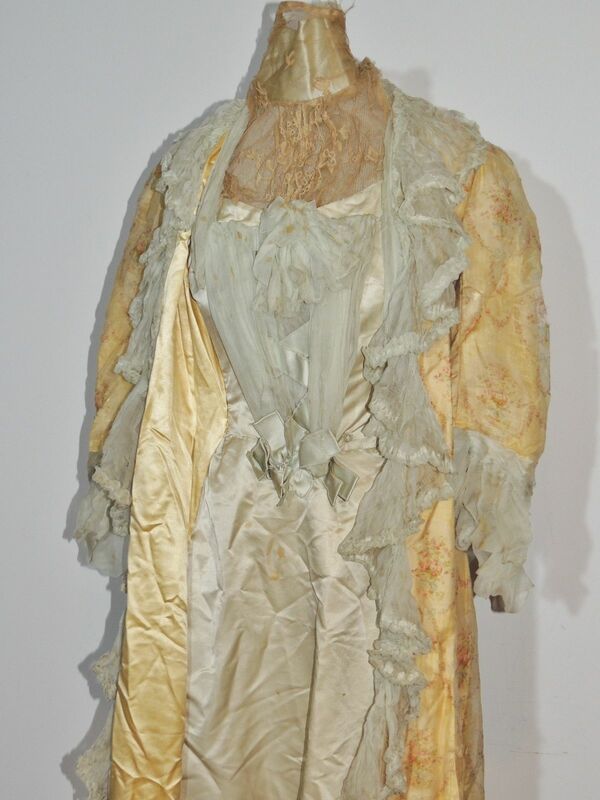 This tea gown is probably from the mid Edwardian era based on the sleeves. 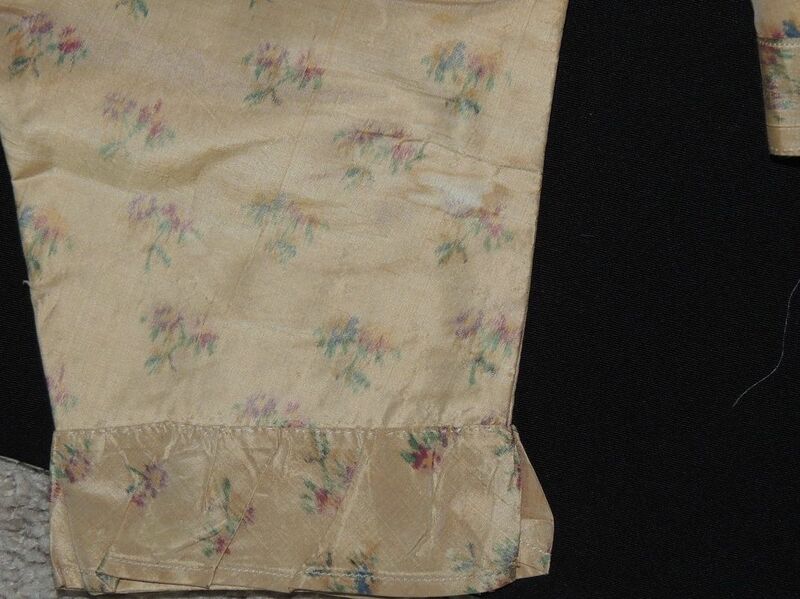 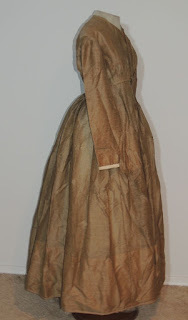 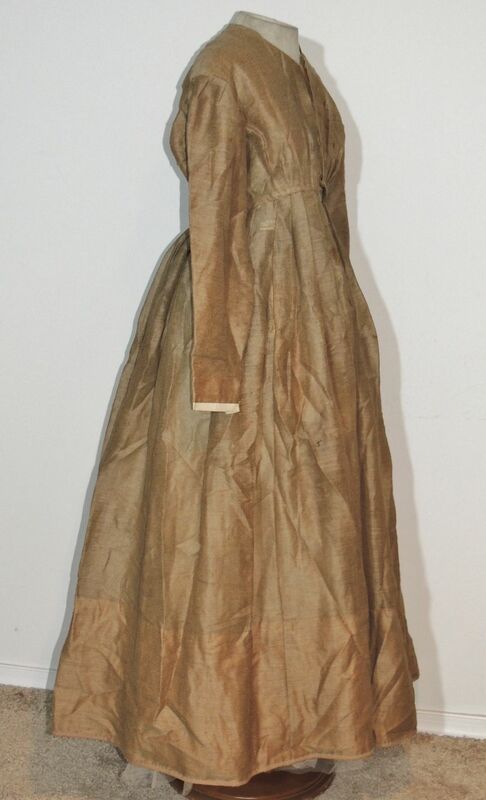 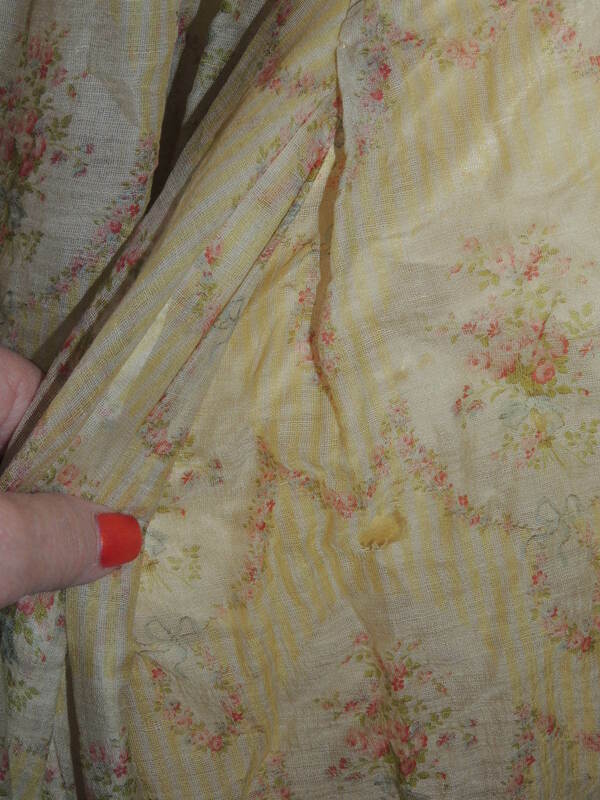 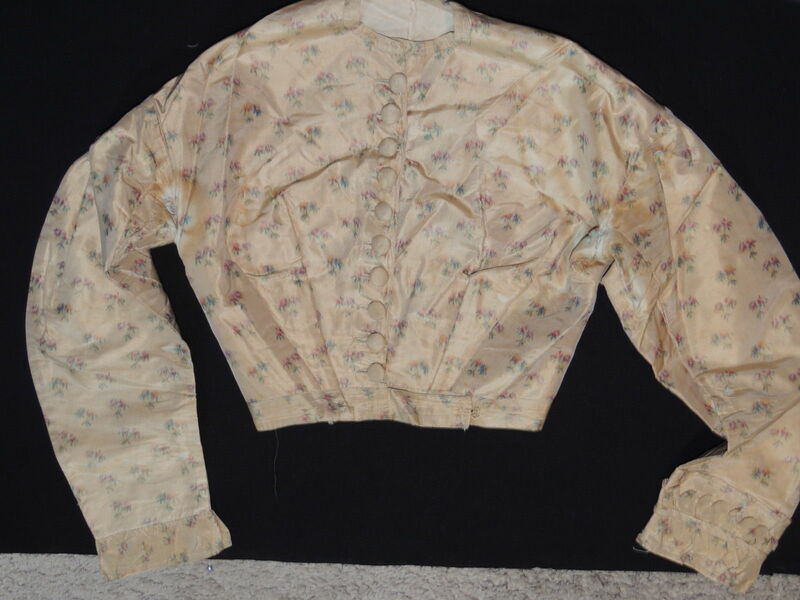 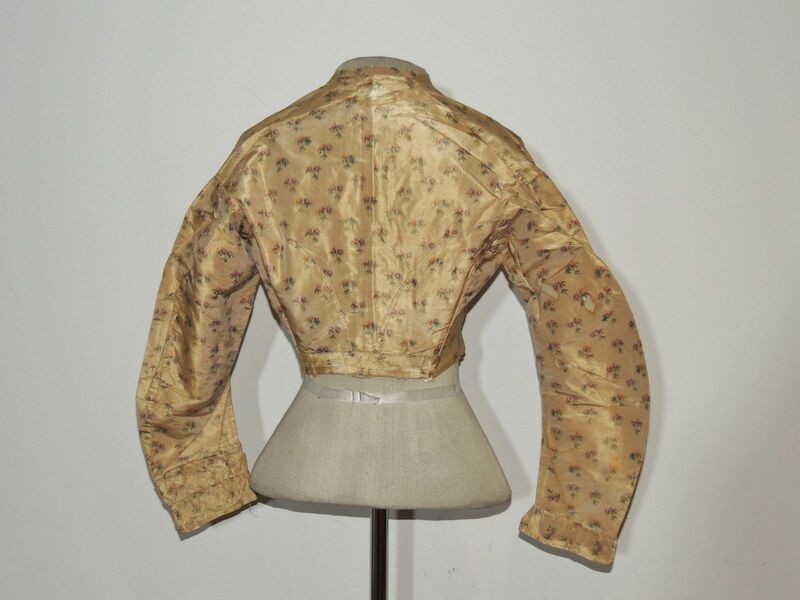 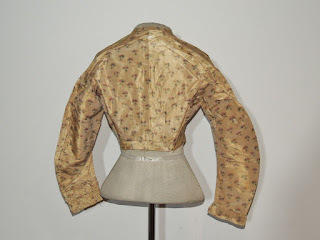 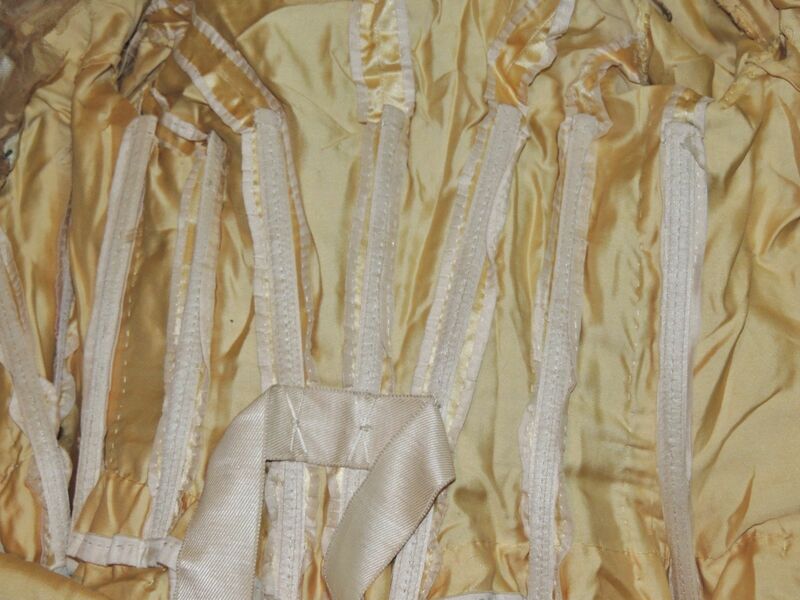 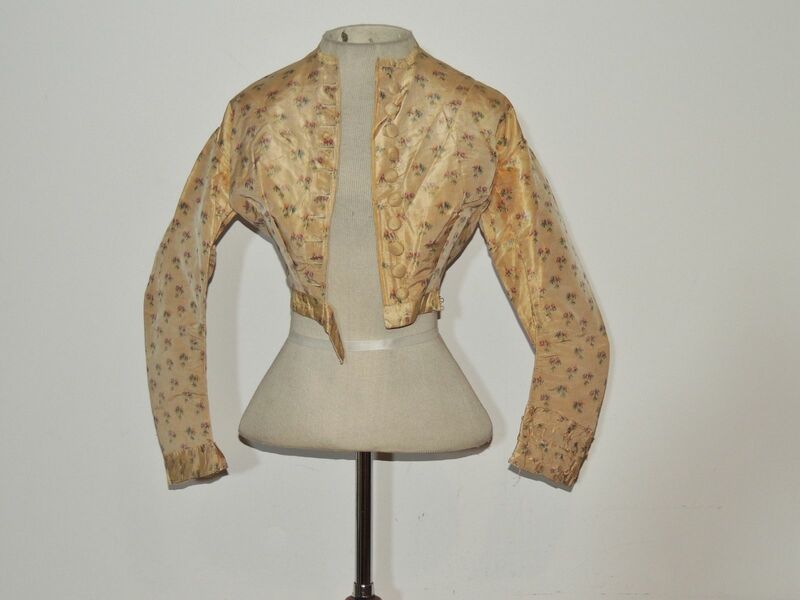 This Civil War era bodice is made from a warp print floral silk taffeta. 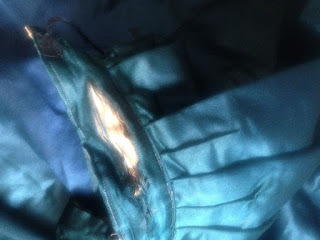 It's lined in cotton, it has dropped armholes with self piping around the armholes. 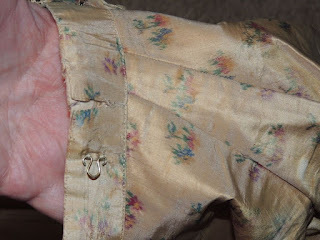 It buttons with covered buttons down the front and has a tab that hooks across the waistband. 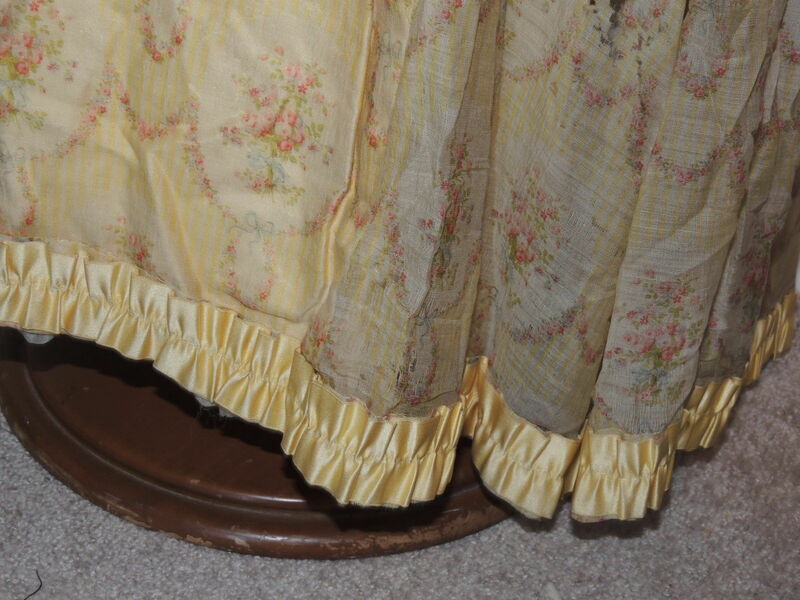 It has 2 darts on each side that fan out and have bones behind them. 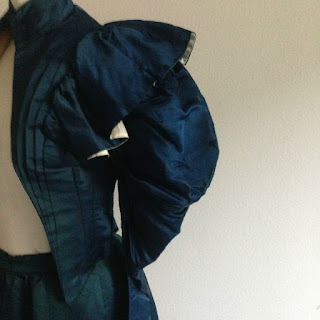 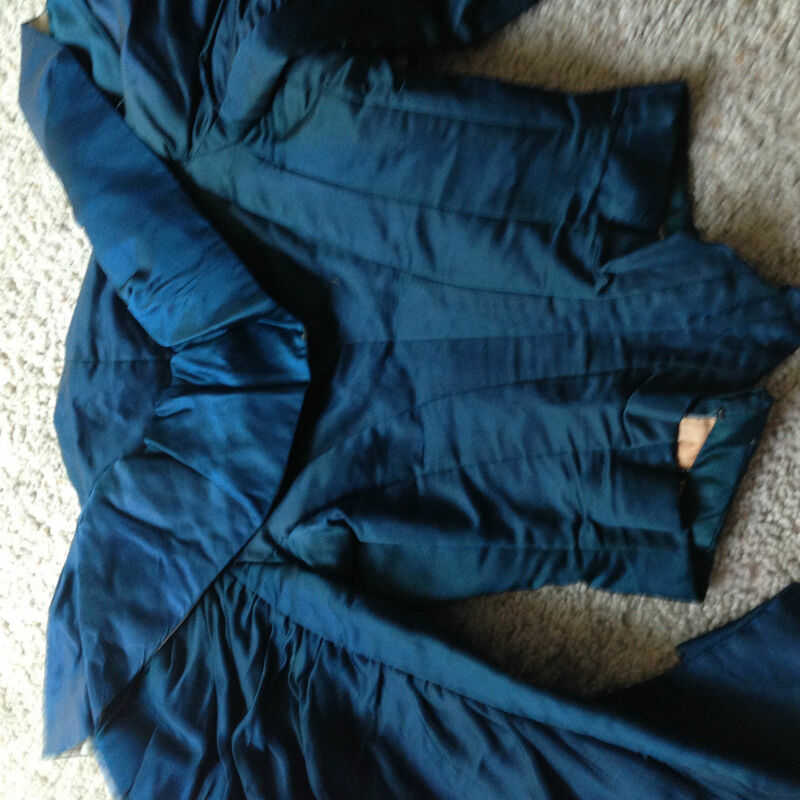 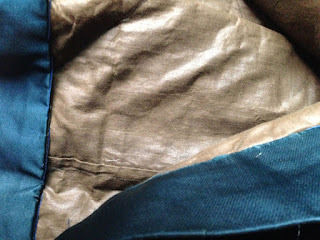 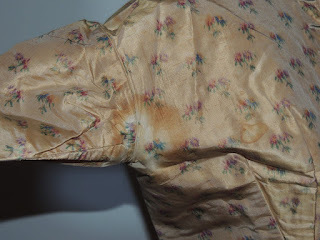 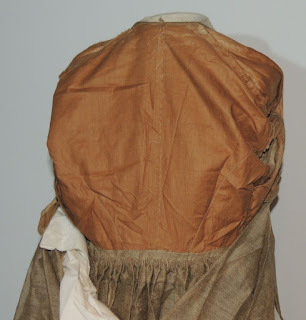 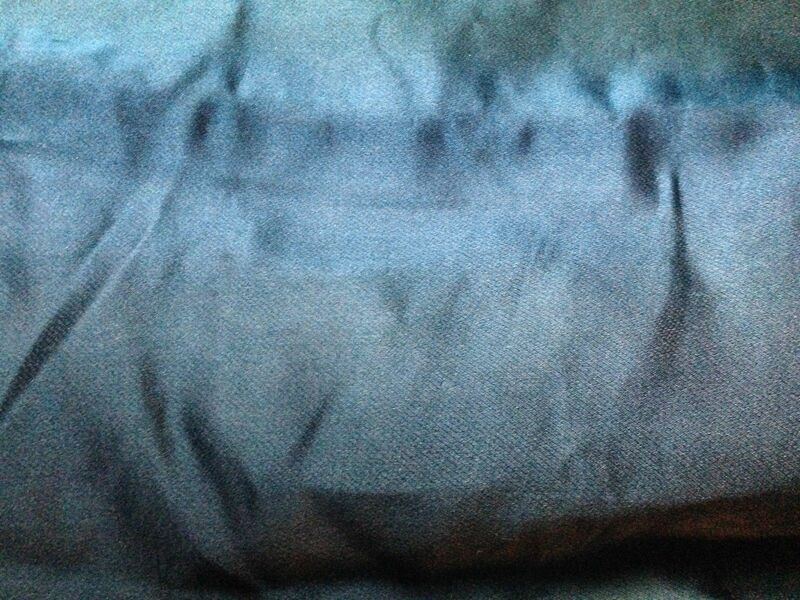 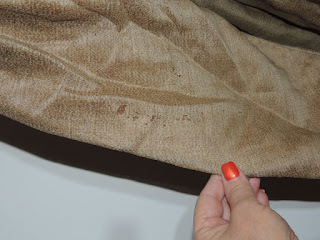 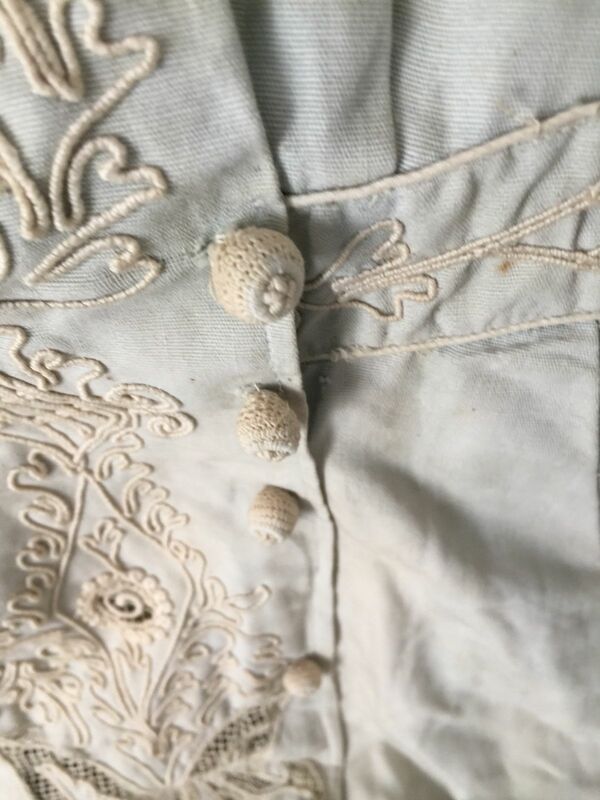 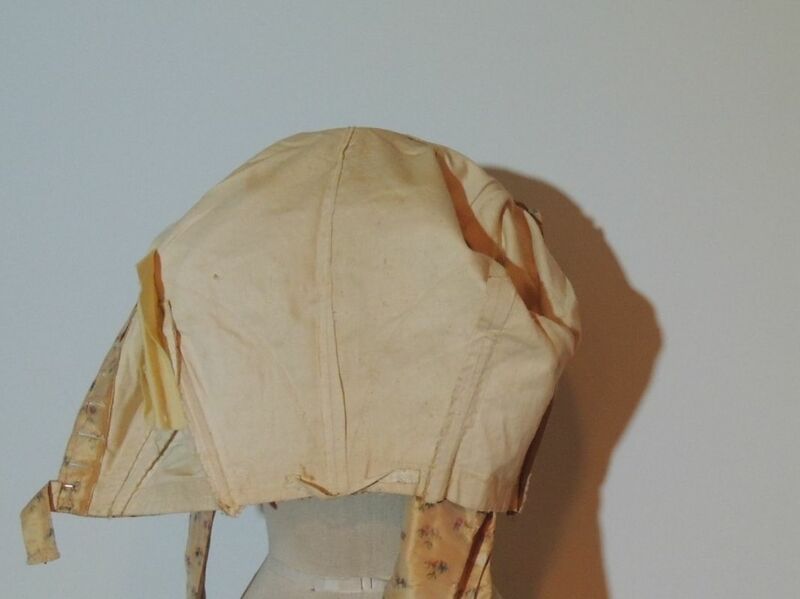 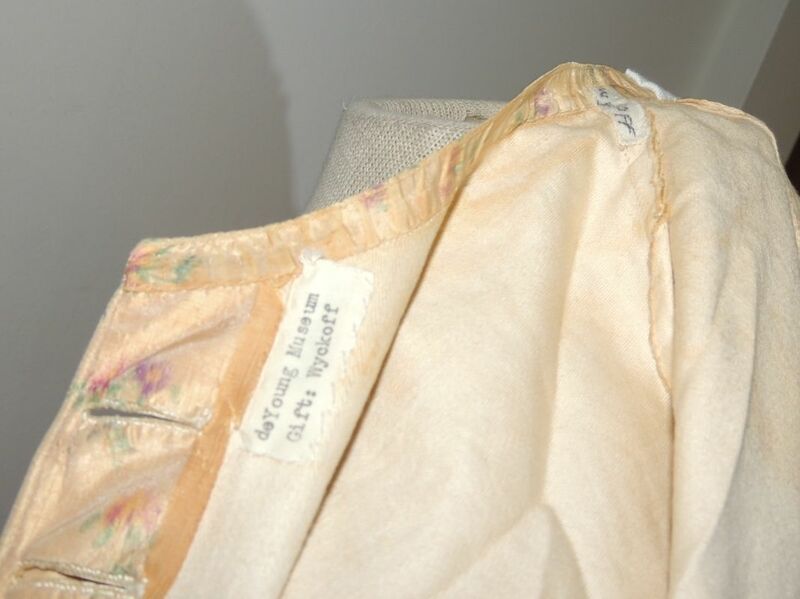 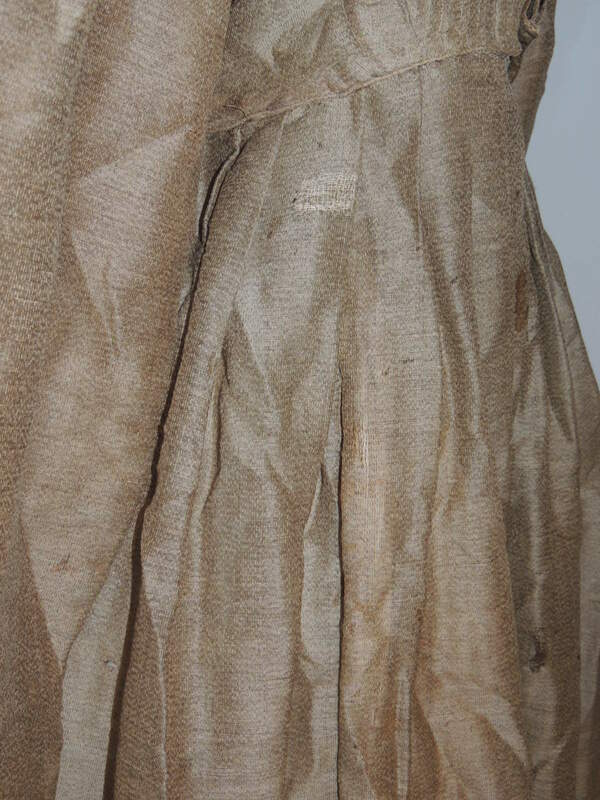 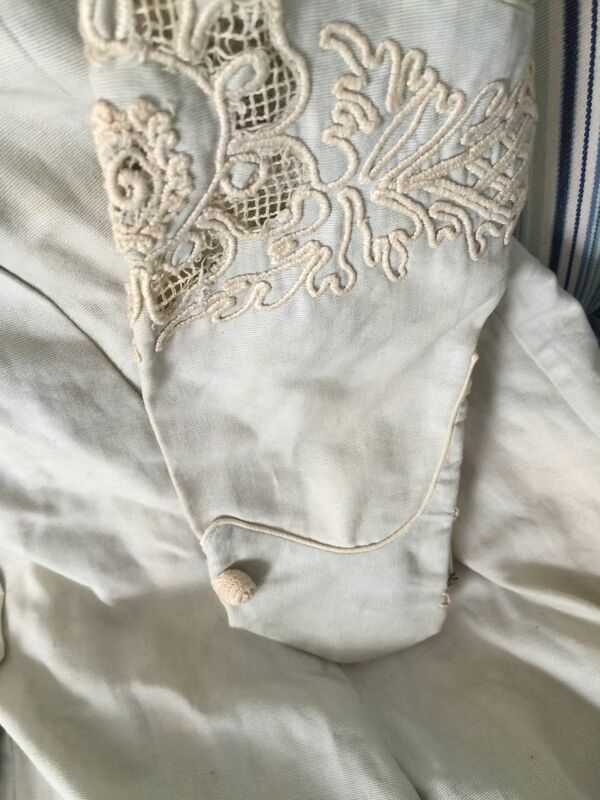 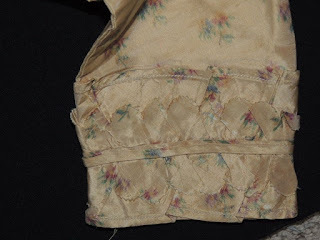 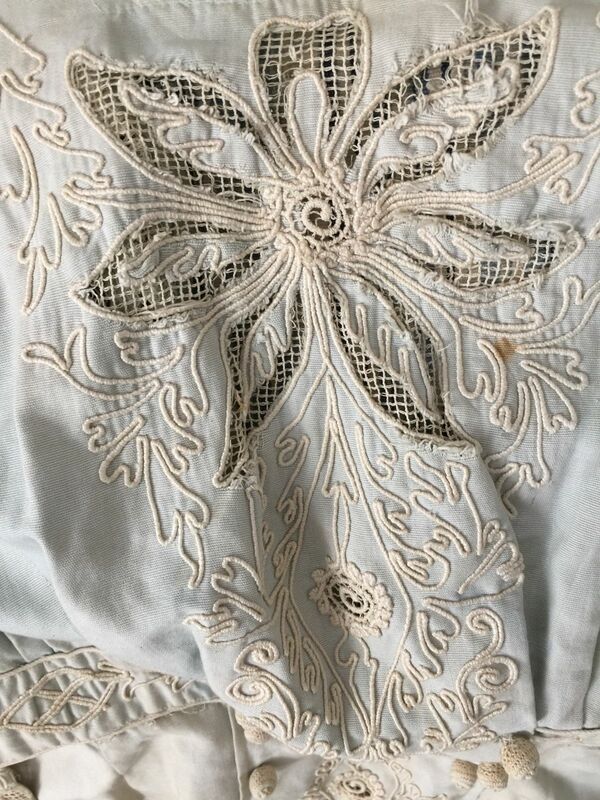 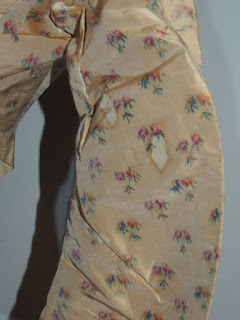 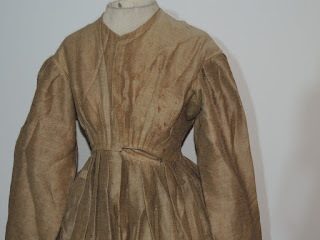 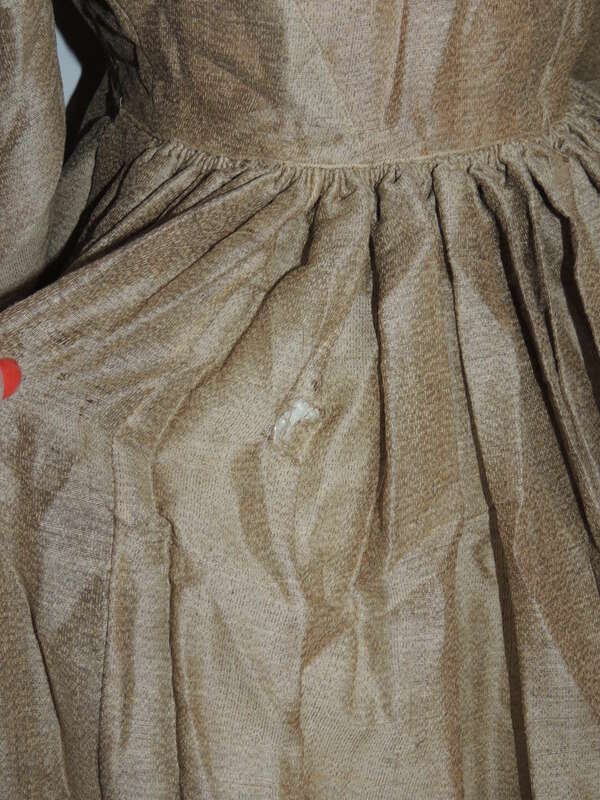 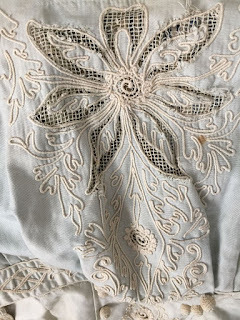 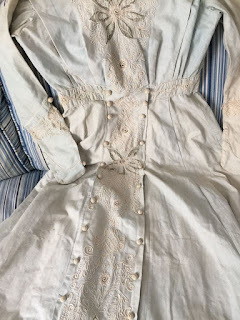 One of the sleeves is missing a ruffle around the wrist, it has scattered spots and underarm stains, a tear on the waistband, but is covered by the tab, waist band is unstitched along the bottom of the waistband. 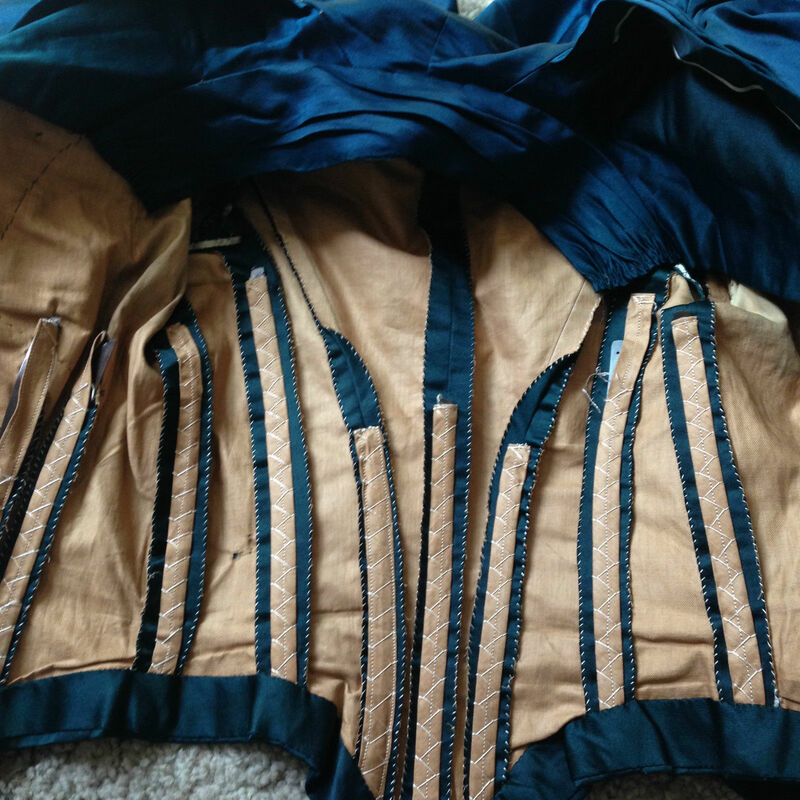 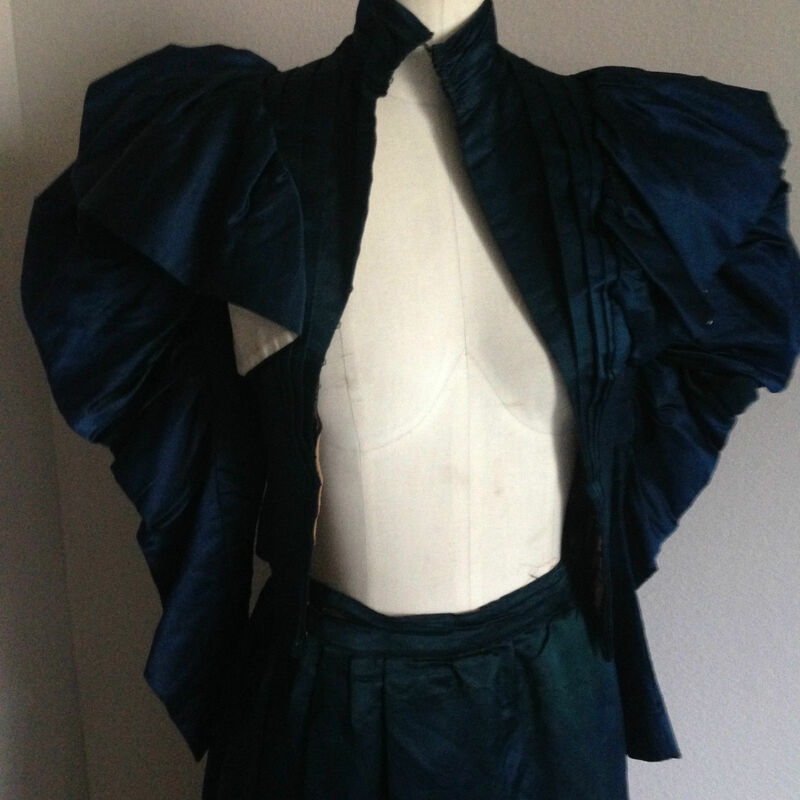 It measures 33 1/4 inches around the bust, waist is 22 and it's 15 1/4 inches long. From the De Young Museum in San Fransisco. 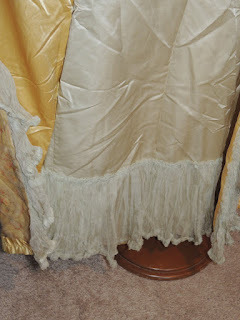 The cut and the trim placement are more in line with the post American Civil War era - although, just barely. 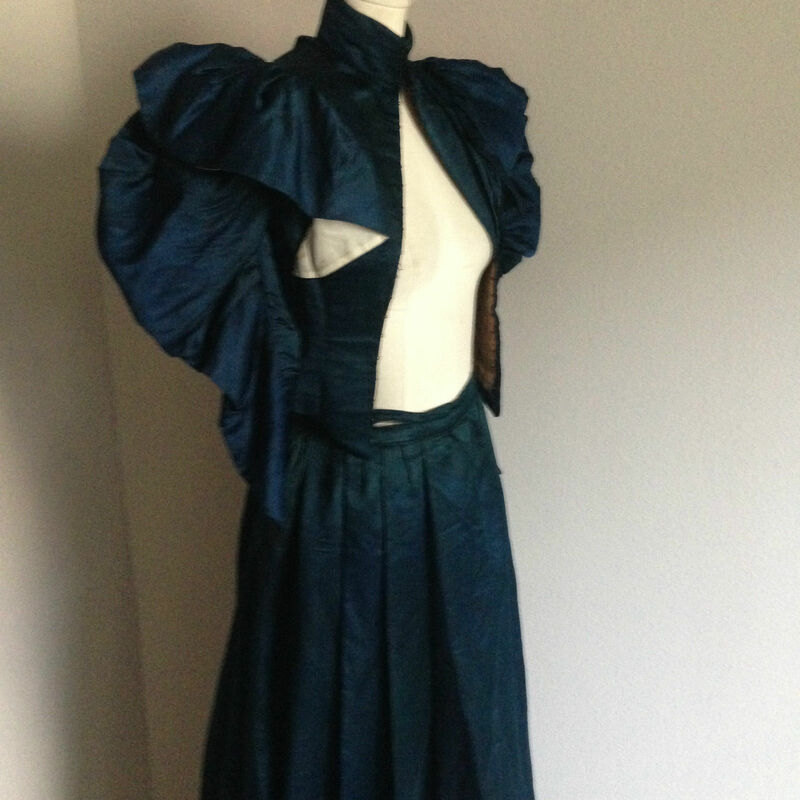 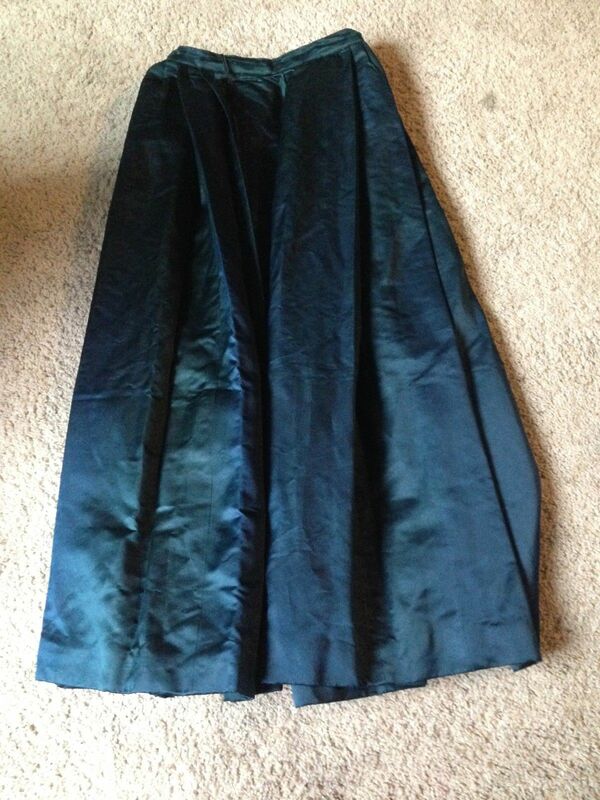 This is a beautiful two piece dress.It is in excellent condition although the waist band on the skirt is torn. My guess, based on the measurements, is this was for a young miss. 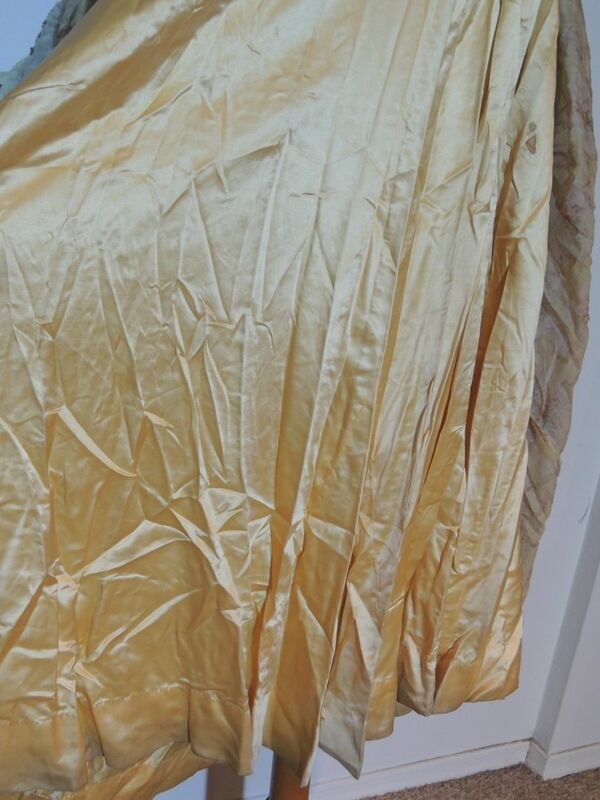 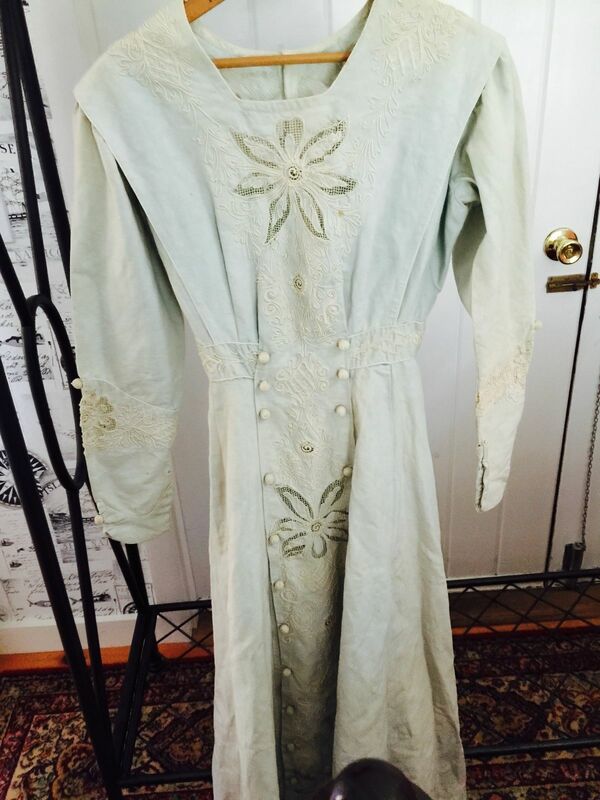 There is nothing unusual about this dress and it's not as unique as the seller believes. 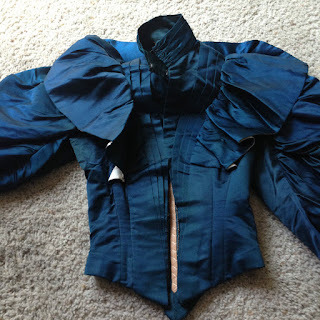 Nor is it formal. 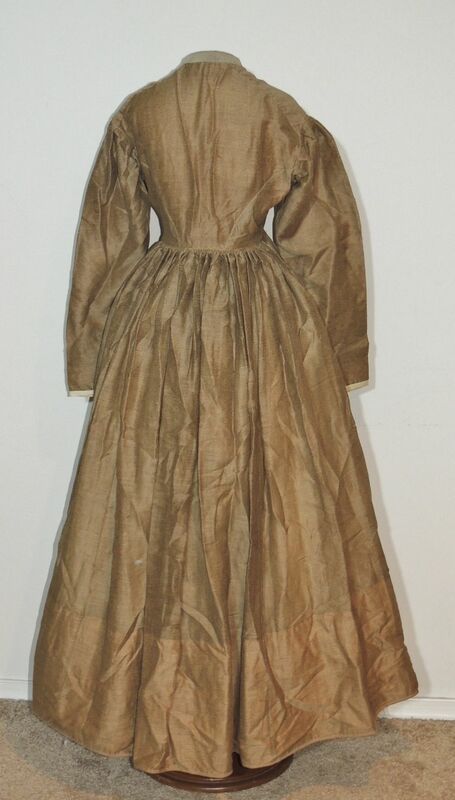 Or from the 1800's. I really wish people would take maybe 10 minutes to do some research on some fashion plates and realize that what they are looking at is a day dress from the early 20th century and not something peculiar. 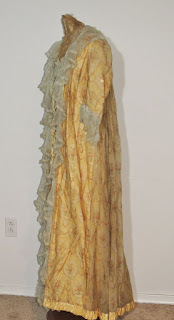 Teen's Era Evening Gown with Sequins!